Upon starting the Applet the "lecture mode" is active. Through deactivating the checkbox you'll find access to the whole list of functions in the drop-down list. The first drop-down list shows all the available functions which can be chosen. The second list defines what property should be represented by the color. In the third list you can chose an overlay (i.e. grid, lines, or equipotentials) which is particularly useful in the 3D-potential mode. With the 4th list you can chose one of the 4 additionally visualizations: non-physical particles, physical particles (with inertia and acceleration) , vector arrows and rotation detectors. The last list defines the behavior of your mouse when clicking in the visualization field. In 3D mode you can change the view angle and zoom. 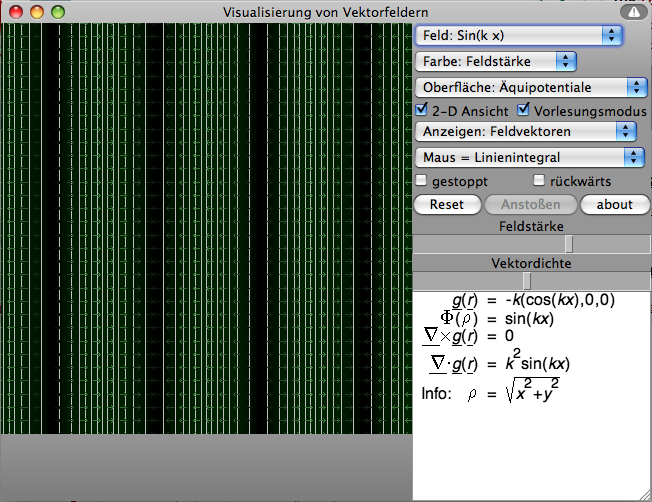 In 2D mode you can choose the line or surface integral to draw rectangles and calculate their values. 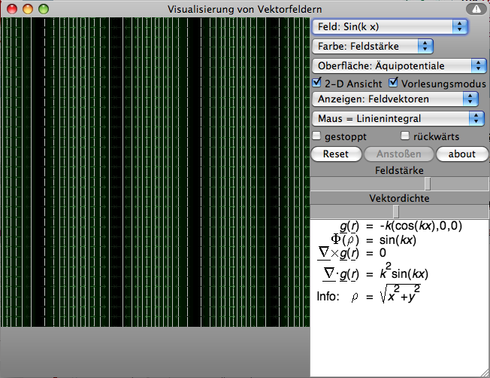 Here you can toggle between 2D/3D and lecture view, stop the particle movement or invert the field. Use the slider to vary the amount of test-particles or the field strength. For some functions (i.e. the two dimensional harmonic oscillator) there will appear extra sliders to change specific parameters of the system.